July 3, 2013, Victoria, BC (ISN) – It was a battle of Lakers green and Shamrocks green Wednesday night at Bear Mountain Arena and unfortunately for the locals it was Lakers green coming out with a 10-8 win. 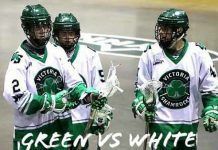 Matt Vinc, suited up in goal for the Shamrocks and will be available for the remainder of the regular season and playoffs while Dan Lewis got the start for Burnaby. The first period saw lots of fast-paced action – end to end runs, hard hitting and lots of goals. Cory Conway got the Rocks on the board with a high hard shot from the dotted line at 1:03. Rhys Duch made it 2-0 Victoria at 4:46 with a bullet from well out. That lead held up for about 3 minutes before Chase Williams replied at 7:49 with a shot that Vinc got a piece of but couldn’t quite corral. 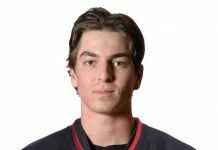 Mitch Jones restored the 2-goal lead for the home team, converting a loose ball pick-up with a high hard shot at 13:27. Goals came in a torrent after that. Burnaby’s Scott Jones scored from well out at 14:46 but Corey Small got that one back just 30 seconds later with another hard shot. The visitors came back on a 3-goal run, Tyler Digby tallying at 16:34, working to the edge of the crease and Dane Stevens connecting at 16:46 as he came from behind the net to beat Vinc. Robert Church made it 5-4 Burnaby at 18:04 with a bullet that went just under the cross-bar. Duch picked up his second of the contest on the power play with just 4 ticks left on the clock, wiring a laser to the top corner. Shots on goal were pretty even, Victoria holding just a 15-14 lead and the teams were tied after 20 minutes. Each team took 16 minutes in penalties as play was very physical. The second period was close and only 1 minor penalty called but the Lakers seemed to get stronger while the Shamrocks struggled at times to connect. Burnaby opened up a 2-goal lead with a couple of early goals. Peter McFetridge scored unassisted on a breakaway at 1:43 and Digby picked up his second of the game at 2:23. Victoria did not reply until the 9:33 mark, Derek Lowe scoring with a low hard shot. Burnaby rattled off a pair off the sticks of Williams, his second at 10:06 and TJ Cowx with a hard low shot at 16:57. Small picked up his second for the Shamrocks at 17:46 and Duch managed another late goal, faking on his forehand and scoring on the backhand at 19:14. Burnaby held the edge in shots on goal 17-11 and were full value for the 9-8 lead on the board. There were many missed passes on the Shamrocks’ part as the Lakers covered them like a blanket. Fans were getting a little sleepy in the third period with only 1 goal being scored, that from the Lakers’ Robert Church on the power play at 4:17. It was a pretty uninspired performance by the home team as they were once again outshot 13-8, making it 44-34 overall for the visitors. Leading the way offensively for the Shamrocks was Rhys Duch with the hat trick.and 2 helpers. Corey Small had 2 goals and 1 assist while singles came from Cory Conway and Derek Lowe who added 3 and 2 assists respectively and Mitch Jones. Rookie Adam Brown had a pair of assists and showed his usual hustle. Matt Vinc kicked out 34 of the 44 shots he faced. At the other end of the floor Dane Stevens had a goal and 5 helpers while Chase Williams, Robert Church and Tyler Digby each scored twice. TJ Cowx, Peter McFetridge and Scott Jones had the others with Victoria product Casey Jackson throwing in 3 assists. The Rocks remain in first place with Langley defeating Maple Ridge in the other WLA Wednesday game, however, it does give Burnaby the season series by a 2-1 margin. Victoria has two road games in the next 10 days, facing Coquitlam on Saturday and New Westminster next Thursday, July 11 before returning to Bear Mountain to face the replenished Langley Thunder Friday, July 12. That night will be Shamrocks alumni night with lots of former players and other personnel in attendance. Game time is 7:45 pm.